It is much harder to measure how much more worth people find in being alive than how many fewer drugs they depend on or how much longer they can live. But could anything matter more? is the failure to recognize that they have priorities beyond merely being safe and living longer; that the chance to shape one’s story is essential to sustaining meaning in life. One of the worst aspects of many “nursing” homes or “assisted living” communities, for instance (and the book includes a fascinating overview of the history of both kinds of institutions) is the loss of control over one’s own ordinary activities, from getting up in the morning to getting a snack or using the bathroom. The most humane and, ultimately, healthy living conditions for seniors are those that do not coerce residents into an institutionalized schedule, stripping them of their sense of self and reducing them to cogs in someone else’s mechanistic efficiency scheme. It’s heartening that Gawande is able to find so many places that have found better ways to operate. (One of my Facebook friends recently posted this link about one residence that’s doing something innovative to foster a sense of life and connectivity.) The governing principle should be trying to support people in a life that still feels meaningful to them, on whatever terms they set. I found it interesting that although Gawande explains how the experience of aging has changed as families stopped assuming primary responsibility for their oldest members, he does not argue that the cure for poor elder care is for young people to step up. Changes to intergenerational structures in industrialized societies have not “demoted the elderly,” he says, but the whole family, in favor of “veneration of the independent self,” and he suggests that this value is now widely shared by older people as well as their children. Thus the appeal for all concerned of retirement communities that preserve independence and individuality while providing essential support services. that we’ve built our medical system and culture around the long tail [of unusually long survival rates or good outcomes]. We’ve created a multitrillion-dollar edifice for dispensing the medical equivalent of lottery tickets — and have only the rudiments of a system to prepare patients for the near certainty that those tickets will not win. Often, his examples show, the feeling of control patients get from choosing yet another treatment — however arduous or experimental — is ironic, because the negative side-effects of many treatments are often what ultimately reduce them to greatest helplessness. The great difficulty is weighing “the mistakes we fear most — the mistake of prolonging suffering or the mistake of shortening valued life.” There is no one formula, no one-size-fits-all answer: the greatest insight Gawande acquires and passes on to us, from his research and from his personal experience (one of Gawande’s central examples is his own father’s illness and death), is that there needs to be a hard conversation with the person most directly concerned — the person whose life is ending — that focuses on what that person considers most important. “We’ve been wrong about what our job is in medicine,” Gawande concludes. It is about “health and survival,” but “really it is larger than that”: medical interventions “are justified only if they serve the larger aims of a person’s life.” The doctor’s job includes helping patients understand their illness and their options in that context. 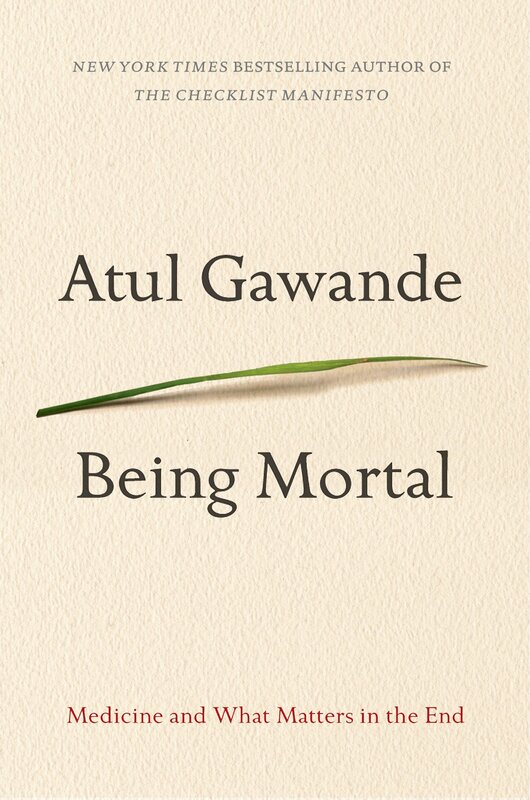 Gawande’s book didn’t make death any less terrifying to me. If anything, it raised my anxiety by being so frank and so vivid about the realities of aging and disease and death. But he did convince me that it is essential to think and talk about these things, because inevitably, one way or another, we will have to deal with them. Denial may be more comfortable, but it leaves us unprepared, and making decisions when you or a loved one is in extremis is not only going to be more stressful in the moment if nobody knows what principle should guide them, it’s also likely to lead to more regret and grief afterwards. Being Mortal seems to me particularly valuable precisely because these thoughts and conversations are so difficult. It prompts an inner dialogue, and may also provide an opportunity for open conversation about dying framed in the positive way he enables: what matters most to you? what trade-offs are you willing to make? what steps will best support you in having the life you want, even when you’re “weak and frail and can’t fend for [yourself] anymore”? For these reasons I think it’s a book that could make a great gift — but it’s also likely to be an unwelcome one. At the end of the three years I’d had to take off work to try and recover as best I could from chronic fatigue syndrome, I found a lump in my breast. I was completely terrified. I was also quite sure that if I had to face vicious chemotherapy I would refuse to do it. After 13 years with CFS, I was not about to die in the same sort of sordid, painful, upsetting way my father-in-law had done. I could not face feeling worse than I had already felt for all that time. I was also perfectly sure that no one else would understand this for one single second. My mother-in-law just snorted at me when I made some mention and indicated my son. ‘Of course you wouldn’t,’ she said. But having put him through a decade of illness, the last thing I wanted was a couple of years of even worse illness to burden him with. As it turned out, I was very lucky. It was just a fibroadenoma, a harmless bit of gristle. And I still stand by the decision I was fortunate not to have to make. I know what it feels like to feel ill all the time and it’s ghastly. I would stand up for quality of life over length of life every single time. But that’s just my choice and I wouldn’t necessarily expect anyone else to make it for themselves. The real problem is that other people are determined to make that decision for you. Fighting off well-meaning family remains the biggest obstacle. I’m not sure I’ve got the courage to read this book, but I admire what the author is saying and agree it needs a lot of considered thought. Great review, Rohan. It’s a very accessible book: I really appreciated how directly Gawande talks (and how well he writes). It’s not flowery or sentimental, though it is often touching and sometimes very saddening. It’s straightforward in the best possible way, and the way that’s so hard for most of us when confronted with these issues. I’m so glad your scare turned out not to be anything worse. Thank you for this review. Everything you wrote here resonated with me. I’m glad – thank you. Excellent review. Gawande has recently been here in Australia and was interviewed him on Radio National’s Health Report. I won’t put the link in but if you google ‘ABC Radio National Health Report Gawande’ you can either read the transcript or listen. I was particularly taken with the vision for nursing homes he sets out. A woman in the audience said that she had established nursing homes for Alzheimer’s patients where they lived in small home-like groups. Unfortunately, at least in this country, the nursing home ‘business’ is increasingly run by large organisations where bigger is more profitable. Thanks for this, Rohan. Thoughtful, as always. A friend gave a copy of this book to my husband as a birthday gift, and it’s been kind of scarily sitting on our dining room table ever since. My parents are both gone, but his are still living (one 85, the other 89 years old), so this book may prove relevant in the near future. And then there’s us, too, eventually. We both tend toward reading fiction over non, but I think this will be a worthy book to turn to at some time soon.